You may drive it every day without really thinking about it. But’ guaranteed when your car starts smelling, you’re going to notice. Here are the top things that can make your car smell and how you can prevent them from happening. Your air conditioning is a life saver every summer, especially on those hot Queensland days. What you may not know, is that – like the rest of your car – it needs regular maintenance to keep going and continue smelling fresh. Bacteria can build up in your cars AC, which leads to funky smells and harmful air contaminants. Hoppy’s offer an Air Conditioner Anti-Bacterial Treatment service for just this reason. So, no matter if you are in Brisbane or the Gold Coast, your summer AC can smell super fresh and keep your cars air bacteria-free. We’re sorry to say, but you are one of the biggest reasons your car smells. Queensland’s East Coast weather can be quite humid and hot, and when your body sweats, your car is going to start stinking. 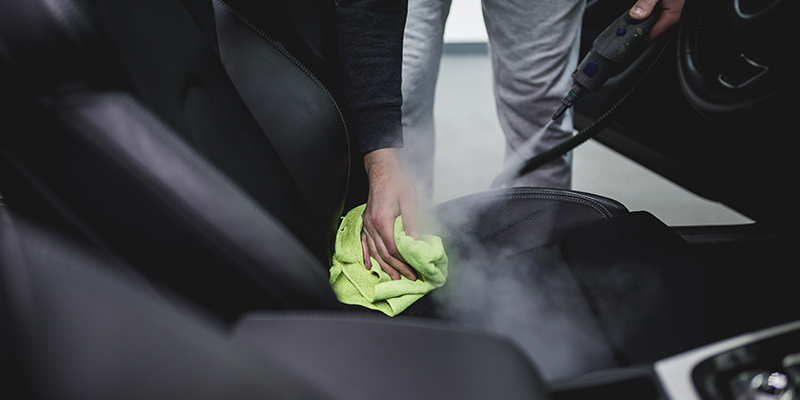 The trick: a detailing service that offers upholstery steam cleaning and sanitising. Do this regularly, as needed, and it will keep all those body odours from making your car smell. All those crumpled up wrappers, tracked in dirt and tossed aside bits of garbage are only going to contribute to the funky smell. Clear out your car! Plus, getting a dashboard dusting, vacuuming and interior clean service is a good way to hit the refresh button on your car’s smell. When in Doubt, Roll Down the Windows! If the smell is bad, roll down your windows and drive your way on over to Hoppy’s Carwash & Café. We have convenient locations across Brisbane and the Gold Coast. We will take care of your funky smelling car, all you have to do is enjoy a coffee and drive away clean.